Learn Dice Control, Precision Shooting & How To Win At Craps! Get Yourself a Craps Table! Are you a winner in business, in your chosen career or profession, but a long-term loser at craps? If your answer is yes, it doesn't have to be, because you can learn how to win at craps. Craps can be beaten! It isn't easy and not everyone can do it, but then again, not everyone can be successful in business and life. If you are interested in how to win at craps, read on. There is only one way to beat the game of craps in the long run, and that is through precision dice shooting and perfecting your dice control at the table. By purchasing your own "regulation" craps table from Golden Touch, you not only are able to practice whenever you'd like, but you are able to perfect your throw without getting distracted by a crowd. This is a great way to hone your throwing skills at the craps table. To control the dice when you shoot so that you reduce the appearance of certain numbers and increase the appearance of other numbers - thus offsetting the house edge and giving the edge to you, the skilled player. Frank Scoblete, gambling's #1 best-selling author, calls such skilled dice controllers "golden shooters," and they are. Why? Because they have learned how to win at craps with the Midas touch! � Intense one and two-day craps seminars in the 8 physical elements of precision shooting: stance and scanning, set, angle, grab, grip, delivery, spin control, and bounce control! � Hands-on small-group workshops with skilled coaches who show you how it's done and work side-by-side and step-by-step with you to master these 8 physical elements before moving on! 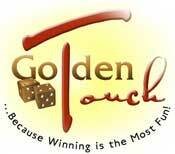 � Strong tutoring in maintaining mental discipline, focus, centering and stamina for making your Golden Touch last at the craps table no matter what the distractions! � Betting strategies based on applying sound mathematical principles, rather than superstitions, so that your Golden Touch is not tarnished by poor gambling practices! � How to maintain your edge while random rollers shoot at the table, based on recent breakthrough, mathematical research! � How to assess your edge and optimize your betting strategies to exploit it! "Luck comes and goes; knowledge stays forever!" Seminars forming now! Call us TOLL FREE at 1-866-SET-DICE.